A.J. Jacobs had written a book titled, Thanks a Thousand: a Gratitude Journey. Thanking the barista who served him coffee was only one step in the journey. Gratitude was provided for every single person who assisted in the process of his cup of coffee. Thousands of people made one cup of coffee possible. Gratitude is a technique for improving one’s mood. Cognitive behavioral therapists argue Thoughts Create Feelings. Thinking negative thoughts (unthankful) cause negative feelings (miserable). Thinking positive thoughts (gratitude) cause positive feelings like (happiness). People are lucky that they have the power to choose their own thoughts. It is like selecting a radio station or a television station or a youtube channel. We all have power over the thoughts we choose to play in our heads. Scenario 1: I wake up. I hate waking up. I hate my alarm. I hate my apartment. I hate my job. I had driving this car on these bad roads to this job I hate. These thoughts would produce depressed feelings. Scenario 2: I’m so happy I woke up again. I’m glad I have electricity for my alarm. I’m glad I have a roof over my head. I’m happy I have a job. I’m lucky to have a card. These thoughts would produce cheerful feelings. Evidenced based practice is the trend in health care today. People want to know that there is research the shows consistent outcomes. 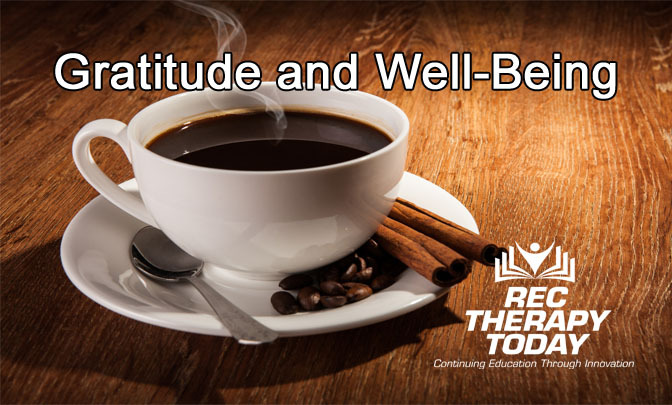 Recreational therapists provide services for people with illness and other health care conditions. Recreational therapists working in a rehab setting may provide services for a person who has lost mobility after a stroke. Recreational therapists may provide services for children with autism or learning disabilities. Recreational therapists provide services for people in acute-care psychiatric settings who suffer from depression, anxiety, or other behavioral health needs. Gratitude isn’t the cure-all panacea. It can be used to help a person to start thinking in more effective and productive ways about life. Validate that it is going to be very difficult for some people to focus on the positives. Click here to download a FREE [PDF] gratitude worksheet. Jacobs, A. J. (2018). Thanks a thousand: a journey of gratitude. New York City, NY: Ted Books.